You might like this game if you like old style arcade games. 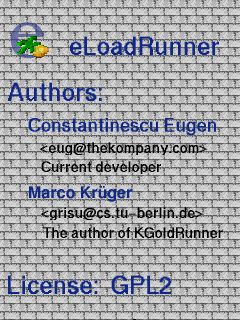 Eloadrunner is a clone of the LoadRunner and KGoldRunner games. 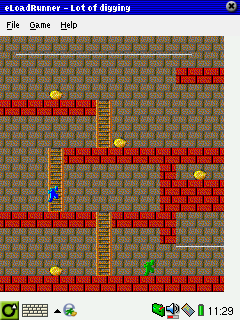 The player controls a small character which has to collect gold nuggets while climbing up some stairs and levels. Unfortunately, a bad guy runs around which wants to kill the player. Only by digging holes the bad guy can be stopped and the gold can be collected. Once all gold is collected the exit to the next level is open. The game involves both action and strategic elements. By reminding of the good old style arcade games Eloadrunner has a certain good feel factor and you look forward playing it. Unfortunately, there are a few problems with the game. The graphics is hard to see, especially if the display is not on high contrast as the colors are all similar and faint. Also the graphics is functional but not very nice. The character is also a bit hard to control. Always when you just manage to escape the baddie your character does not hit the stairs properly. Furthermore, the levels show few variations which would keep you playing. Nevertheless, the game is worth a try if you like the old style aracde games.